BRIGETY: Ladies and gentlemen, good afternoon. My name is Reuben Brigety, and I am the dean of the Elliott School of International Affairs at the George Washington University. I am also an adjunct senior fellow for African peace and security issues here at the Council on Foreign Relations. I will be presiding over today’s discussions. Welcome, all of you, to the Council. May I remind you of two brief administrative notes? First, please note that this meeting is on the record. Second, I remind you to please silence all electronic devices. We will proceed today first with remarks by our guest of honor, and then we will move to a moderated question and answer period. TSHISEKEDI: Good afternoon. Good afternoon to everyone. As I stand here before you today, and I arrived here in the United States, and I’ve come here to talk about my country, the Democratic Republic of Congo, the DRC. I’ve been told that this room has a number of specialists, experts on the DRC. And I’m very happy to see that because now I see that I will be speaking, discussing with people with whom I will not provide a lot of explanation, and who know our country and will understand us well. I would like to—I would like to say that I hope we will all have a wonderful discussion here this afternoon. And I would like to thank the organizers of the event who have, once again, given me the opportunity to speak on behalf of my country. For a few months—a few months ago if I had come here to speak before you, I might have painted a more somber picture of the situation in my country. And I think that we were really in a very difficult situation at that time. And I think you would have agreed with me. I would have also told you that we feared that our country would fall into a situation of violence and a bloodbath. All the indicators were on red and everything was pointing to the fact that our country risked falling into violence. However, what happened on December 30, 2018 not only for those who, like me, believe that a miracle took place, but also it was a historic moment because this was an event that took place and allowed us to have a change of power that was done in a peaceful way and, something that is also quite rare in Africa, it allowed us to bring in an opponent from the opposition party, somebody who, moreover, came from a party that was radically opposed to the president in power. So this was a historic moment. Since this time, we have struck a balance. Of course, it is still fragile, but we still have made—have managed to strike a balance, a balance that we continue to encourage. And that is why I am here. I am here to ask our traditional partners, the partners of the DRC, including the United States, to help us and continue to support us so that we can make sure that this fragile equilibrium becomes more solid and allows the Democratic Republic of Congo to finally become a democratic republic, and to become a democracy, and to make the transition from the time where we had single-party rule. And where the deputies have taken many risks, sometimes even at the peril of their own lives, to help overthrow the dictatorial regime at the time, and to obtain in our country the foundation with a rule of law and democracy. I believe that today, without any pretention whatsoever, my election has given us the opportunity to finally put into place the dream of our founding fathers, which was to see a country of democracy, and to see democracy fully implemented in our country. It’s been a little over two months since I was sworn in as president of the DRC. And I wanted to mark this transition by giving a clear signal that we will be making a clean break with everything that happened before I came to power and with all the problems that have been at the very root of the destruction of Congo. One of the first measures that I have taken was to close down all of the jails and detention centers that were being used by the political police, even though officially they were the intelligence service, from the former regime. And I have been told that these were actually jails that were legacies of the colonial period. So I have closed down all these jails because for me there is no longer an—there will be no longer any arbitrary arrests. I have also sanctioned all those who have been complicit in illegal activities up until now. Some of our managers of public—of our state-owned companies, some of our ministers, for misconducted have been—have been punished for misconduct, because the message I’m trying to send is very clear: I do not wish to see any more corruption in our country, any sort of illegal activities, bad governance, and especially impunity, which encourages people to continue in these activities because Congo today, the DRC, is now standing up and we are looking at our wounds of the past, trying to heal these wounds, and to look to the future, and to chase out these old demons of division, disorganization, and chaos. However, I do know that it is a country that has been destroyed for a long time by political systems that have really affected the Congolese people. Both our men and women of Congo, a system that has delayed our development, and delayed us with respect to our African neighbors. We actually have the capacity to be a regional leader, and a leader of the continent. And therefore, we absolutely must attack this plague through very clear measures and, above all, through a new dialogue—breaking with the past. However, we cannot go about this through a systematic and brutal cleansing, because the country has made great progress, as I’ve said. The system that we now have in place and that is being changed is a system that was put into place with the arrival of the FDLR and has been in place for more than twenty years. And for twenty-two years, as you may well imagine, this regime has really taken root at the heart of the republic and developed many tentacles. As we were able to have this peaceful transfer of power, unlike all the other changes of power we’ve had in our country in the past, we of course will—it will take some time to fully throw off the shackles of this former regime. So I am here to throw off the shackles of this dictatorial regime that was in place, because our country, the Democratic Republic of Congo, needs to enter the era of democracy, and a new era that will help us move forward. And we have great potential to do so. My visit here in Washington is a visit where I hope to call upon the United States to be a partner with us in this great undertaking, and to—and for as long as possible—for me, as long as possible would be the best, because without having serious support and powerful support, I believe that we will have even more difficulties getting out of the current situation. Given that the United States is a country that knows the Democratic Republic of Congo very well, and has been a partner even before colonization, I think that the U.S. is the ideal partner to help us to undertake this great adventure. The first challenge that I would ask our American partners to help us with, and to help us attack, is the challenge of peace and security. I’m sure you are well-aware of the situation, and you know fully that Congo is in the throes of waves of destabilization that have been brought about by various armed groups, local armed groups, but even armed groups that are foreign in nature. And for several months, based on reports that have been given to me by our military intelligence services, there is even an Islamic threat—Islamist threat. And we fear that with the defeat of ISIS in Syria and in Iraq, that these terrorists groups would then try to deploy to Africa, which is really a soft spot for security in the world right now, and also a formidable reserve of natural resources that could be used to finance their terrorism activities. Therefore, the DRC’s problem or issues with peace and security in the DRC are no longer a problem that affects only the Congo. This is a problem that has become an international problem. And if we truly want to overcome this issue, it is now the time that we need to take action and to fully tackle the issue so that we can eradicate all terrorists and terrorist activities once and for all. It is still possible because they are still having difficulty fully taking root in our country. So we can still tackle this problem. I would also like to ask our American partners, in our efforts to restore a government worthy of this name. After all these years of corruption and dictatorship our government has destroyed our government. As you may imagine—as you may know, in the DRC we don’t even know how many Congolese citizens we have. In Congo today, we don’t even have a national identification card. The only identification card that serves as an ID card are the voter registration cards. But we know very well that those cannot be issued to minors. So we can take a guess that we have a population of about eight million, but we can’t be fully sure of this figure. We also do not have credible institutions that are effective and able to collect revenues, stemming from the productive activities in our country. And this is something that is a profitable arrangement for many people with bad intentions. And according to some experts, there are approximately $15-20 billion that escape the public treasury every year. So this is $15-20 billion that could do a lot—a lot of good in the DRC, especially in terms of promoting the development of our population. Here, again, the American experience, the effectiveness and the credibility of the United States and their institutions, could be a useful model for us, and could help us to overcome this situation. Once we have reorganized and restructured our government, and we have implemented fully rule of law, along with a more effective judicial system that is more credible, we will finally then be able to be an attractive place for investors. And here, again, the United States can be a partner, a significant partner, and to help us with all that we are trying to accomplish in our country. I would like to, first of all, give you some information about the country, some facts underlining the fact that we have huge potential that could be of great interest to America in terms of the strategic minerals reserves. We have uranium. And you know what—you know how valuable uranium is, but it can be a very good or bad source, depending on what types of hands it falls into. We also have cobalt, which is, of course, used to—in all sorts of technology, modern technology, and for tomorrow’s technology. We have niobium, we have coltan. And all of these high-tech industries with new technology are in great demand—or, these minerals are in great demand for these technologies. We also have the Inga Dam site, which could produce between 45 and 50 megawatts if we—once we were able to fully implement all phases of the project. We also have numerous other sites, more than 200 sites where we could construct smaller dams, micro dams, that could also produce an enormous amount of energy to the country and help us to give a new boost to our industrial activity. We also have solar energy, and a great deal of sun. We know that the United States is also on the leading edge in these renewable technologies. And there, again, the United States’ contribution could be helpful. We have agriculture. The Congo has eighty million hectares of arable land and about 10 to 15 percent only is being developed at the current time. But if we were to use better technology and use our land better, Congo is actually capable of feeding two billion humans. But of course, in order to achieve all this, we have to have peace, security, and stability in the country. This is why the United States could be an important partner for the DRC and support us in the reform of our army, which has been—which is a project underway. But it has been slow in coming, simply because we don’t always have the means or the resources or the resources weren’t allocated to this reform and were allocated elsewhere. But we do need to continue reforming our army, to strength its capacities, and especially make it a more professional corps so that it can actually undertake its primary mission, which is to defend our country rather than to take it out on the citizens. This is what I wanted to say in summary concerning my vision for the country and my expectations or hopes in terms of our partnership with the United States. We’re hoping to see a partnership that would be what I would call a strategic partnership, because I believe that it is in the mutual interest of both countries, and that it will be necessary to have this partnership for both countries. This partnership will be both beneficial for the United States of America and for the Democratic Republic of Congo. As I was saying previously during other meetings I’ve had this week with other partners, the United States—in today’s world of competition, and a competitive world, and globalization—the United States needs to have a powerful partner at the heart of Africa. And the Democratic Republic of Congo has the right profile to be this partner. BRIGETY: Your excellency, thank you very much for that very strong, clear presentation. Allow me also to say that we are most honored to have you here with us today at the Council on Foreign Relations. To my colleagues in the audience, we will proceed by my asking a couple of questions to His Excellency. And then we will proceed for the balance of the time to questions and answers from the audience. Your Excellency, let me begin with a couple of questions that I know are on the mind of everyone here. You talked about the historic election that happened in the Democratic Republic of the Congo, with the first-ever peaceful transfer of power from one person to another, as a result of the election that brought you to office on December 30th. As you well know, there are many in the Congo, across the continent, here in Washington, who argue that Mr. Martin Fayulu in fact won more votes in the election, and thus have, at best, strong concerns about the legitimacy of the election that brought you to the presidency. Can you speak directly to those critics about the nature of this past election, and about the nature of your holding the office of the presidency now? TSHISEKEDI: Thank you. As you know, I was just talking to you about the government of my country. Our administration, which is still not fully organized. And therefore in this type of a situation, the cacophony that tends to—tends to come about with this could be something that almost any political actor could take advantage of to advance any sort of political argument. Even the United States, which is a country that is much more organized than ours on the administrative level, have not been spared these types of electoral disputes. You may recall the Al Gore and George Bush elections, where there were weeks and weeks of electoral disputes. And in Africa, we were wondering how this is possible that the champions of democracy have these types of problems as well, and this phenomenon. So all this just to say that there are never perfect elections. The second point I would like to say with respect to the elections is that an opportunity was provided to those who wanted to dispute the results, and to show that their—to prove that their arguments were true, and that he was in fact the winner and that his victory was stolen from him. And so he appealed to the constitutional court. And all the world’s press was there. The opportunity was given to show the entire—before the entire world that this victory had been stolen from him. But for your information, he never did this. Our lawyers were also there. And they were able to prove that I was the victor. Now, with respect to his strategy, his electoral strategy, let’s say a few words about that. Mr. Martin Fayulu, since this is whom we’re speaking of, was certainly a political actor. But we have to also recognize that neither him nor his party really had a national dimension, unlike my party the UDPS. Therefore, it was only by rallying other political actors that he was able to gain this notoriety. And throughout his entire campaign—and here, we’re talking about November. The elections were held in December. So he only had one month to gain all this notoriety. And during the entire campaign, all he did was to tell his voters to not go out to the polls and not vote, because the voting machines that were going to be used were not—were not reliable, that they had been manipulated. This is what he was saying, that they’d been manipulated to vote for the candidate who is basically representing Kabila. This is what he was saying over and over during his campaign. Whereas, during my campaign, I based my campaign on the fact that we needed to vote either with or without the voting machines, but that we had to make sure there were observers at all the polling stations and that we were able to overcome any sort of attempts to rig the vote. And just a week before the elections, Mr. Fayulu changed his strategy, and then finally joined with our position. But, just to give you a quick side note, before that—before he was against the voting machine, but he was saying that we had been corrupted by Kabila because we had agreed to using the voting machines and agreed to a rigged election. But then he finally came around to our position. And so maybe you could have asked yourself—we wondered whether he had also been corrupted by Kabila to change his position. Having said that, he changed his position. So in a country that is the size of the DRC, with all the difficulties we have with communication, you can’t tell me that the voters in four days were able to get this information mobilize and come out in greater numbers than the UDPS voters, and vote for Martin Fayulu. Of course, you’re not—in the rest of the world, you don’t necessarily know the DRC. But those who live in the DRC know that this is actually impossible. There’s no way this could have happened. And the proof of this is that when I was declared the winner, the definitive winner, and even when I was declared the provisional winner and then the national definitive winner, there were scenes throughout the DRC where people were overjoyed. And then—but for Mr. Fayulu, who claims to have gotten over 60 percent of the vote, we didn’t see any demonstrations anywhere to protest the publication of the results—those who were supposedly in favor of him. What we did see, on the other hand, were acts of violence that were produced sporadically throughout the country, and attacks against some of our citizens. And they were against people who were identified as coming from the same province that I come from. So these were basically acts of tribalism, and that these were—they were trying to attribute these to me. And there were victims. Many people had died as a result of these attacks. But yet, he still didn’t manage to mobilize the population as he wanted to. So I think this is the proof that the arguments that he is advancing are false. And I can continue by saying that certain religious organizations of civil society were being brandished. I won’t cite the names, but I’m sure you can easily find them, or you can easily imagine which ones I’m speaking of. These religious organizations supposedly affirmed that they had proof that the results of the elections were false. And this religious organization even went so far as to claim that they had accredited forty-four thousand observers. This information was—rather than having forty-four thousand observers, in reality there were actually only seventeen thousand electoral observers that had been accredited by CENI, the electoral commission. And of these accredited observers, only about five thousand were actually out in the field on the day of the elections—in other words, on December 30, 2018. The other issue that’s raised is why those who claimed to have the truth have still not been able to fully back up this truth. And I remember—I recall that our observers, because we also took the time to organize two electoral centers. And I stress that two, because there was an official one, well-known, and then another unofficial electoral center that we kept secret for strategic reasons. But the representatives of our electoral—our official electoral center went out to see the representatives of this religious organization to compare the results. But at no point in time were they convinced that the candidate that was claiming victory actually had won. And yet, these are religious organizations. But there was not unanimity amongst these organizations. There were some religious organizations who disputed this proclamation, and who contested what their colleagues were advancing, and who were supporting the publication of the results by the constitutional court, which designated me as being the winner of the elections. Now, it’s true, and I have no doubt, there were some imperfections with the elections, certainly. As I said, no election is ever perfect. However, I do not believe that my victory was obtained through fraud because anyone who knows the Democratic Republic of Congo, and you—as I’ve been told, you are specialists and experts in international relations—you must also realize that what UDPS represents in our country. And all the present—all the demonstrations, even the most recent ones, have shown the popularity of our party. So to say today that UDPS, with its glorious past and the human sacrifices and political sacrifices that it has made, to say that it rigged the elections is really something that is—that is something that tarnishes the names of all of our martyrs, and all of the people who have fought so hard for democracy and for the fight for democracy that we have carried out for over thirty years. So I strongly contested this argument on the strongest terms as possible. And I would still say that the person who is contesting these elections needs to bring proof, because he cannot just hide behind argument XY. He has to actually bring proof to show that he really, truly did win the elections. Thank you. BRIGETY: Now we will please move to the floor for questions. I will ask if you have a question, please raise your hand and one of my colleagues with a microphone will come to you. I ask that you ask a question, noting that a question ends in an interrogative. If you have any difficultly making your statement into a question, I will be more than happy to assist you in that regard. Yes, Steve Morrison. Also, please state your name and affiliation. Q: Good evening. Thank you very much, your excellency. I’m Steve Morrison from CSIS, Center for Strategic and International Studies. My question is—has to do with the Ebola outbreak in the east. As you know, things are not going well. Over 1,100 cases, well over six hundred fatalities, and the trajectories on health scores are very disturbing. Security and active community mistrust and resistance are the biggest challenges. So my question to you is, what might you being doing that’s new and different, as opposed to your predecessor, in bringing the power of your office to try to correct the situation and avoid further expansion of this very dangerous outbreak? Thank you. TSHISEKEDI: Thank you very much. The Ebola outbreak is a concern, a great concern for our country. The only good news that we have until now is that we have been able to contain the disease. The region of Beni, for those who know the Democratic Republic of Congo, is a road—a great—that is close to Uganda, to the borders, and also a core where you can go to—back into the country. So it’s really a good area from where people can really extend and have a very—have very great impact. But, thank God, until now we have been able to contain the disease and contain the outbreak of the disease. The problem that we have today is to eradicate and attack the disease. When I arrived at the end of the January, I did not delay to invite the minister of health in order to have a status on the situation, that he would report to me on the situation. And this allowed me to see that there were some issues, notably in the utilization of the knowledge and the resources that we have—the underutilization of the resources. And among those it’s setting aside people who have a world—who are known globally for fighting against Ebola, people who have contributed to the fight against Ebola when it hit South Africa, when it hit Sierra Leone. One of them is Professor Muyembe, who was set aside—who was never associated to this work. And so I started by starting a small cell agency that professor Muyembe is leading, so that he will be able to go on site and strengthen the capacities of those who are already working on site. But you must know that we are facing difficulties locally. The first one is insecurity. Twice already the center where the sick people are kept was attacked—twice. So of course, all the people who were sick had to scatter. And even some of the—of the medication have been taken away. And unfortunately, this is a consequence of the uncontrolled armed groups who are causing desolation in that region. The second difficulty is more cultural. Many of our countrymen in that area, in that region, they think that it’s a plot against them that this disease is an imaginary one or has been fabricated to come and kill their population. And those who think that this is a fake disease, that it doesn’t really exist, and they are not hesitating to get in touch with the disease, with the sick people, or even to try to protect them while they try to run away from the doctors. Others try to protect them. And so that creates a tendency to make things worse. So we have problems at multiple levels—at the security level, at the cultural level, and even, again, at the scientific level—to be able to attack even the disease in order to eradicate it. And so that’s why it will take time. And that’s why I have strengthened this by adding a specialist that is globally known who can help us see together what we can do. In addition to that, I have another good news, is that I had welcomed the head of the CDC in Atlanta, who came to Kinshasa. He came to manifest his support to us, and who promised many good things. He has many good news for the fight against this disease. So we believe that his input will also be determining in order to strengthen the fight that we have already started. And like I said, until now, the disease has not broken out of the region of Beni. And we pray that it remains this way, even though, of course, we are very worried about the sick people who run away after the second attack of the health center where were admitted. So I hope and I believe that it will not go further than this. In any case, we are determined to fight against this disease. And all our willingness and all of our expertise is welcome to come and strengthen us in this fight. Thank you. Q: Thank you, your excellency. I’m Jay Kansara with the Hindu American Foundation. And my question is, what steps are you taking to prevent and combat foreign interference into the Democratic Republic of Congo in three areas? One is the debt trap that many of your neighbors find themselves in in China. Second is the Islamic State, where their ideology could infect, you know, citizens of your country. And, third, is predatory NGOs who seek to exploit conditions of your country for their own gains. 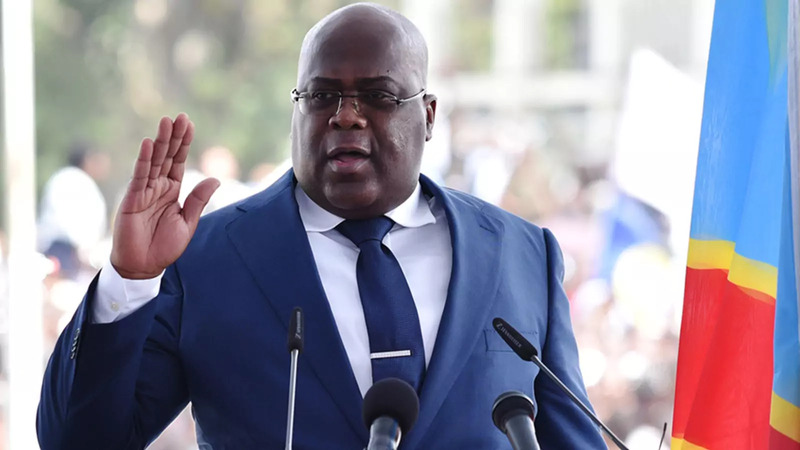 TSHISEKEDI: For the first and the third, I believe, question, for the debt and talking about the mines, I believe I spoke about this a little bit when I spoke about the administration, the government and good governance, and when I spoke about the fight against corruption. I believe that in order to be able to solve these problems, we would need ourselves to be well-organized as a state. And we are a state that is able to generate a lot of wealth, so that we would be able to pay our debt and also to become more credible to attract more investments. And that’s why I believe the field that is before me, it’s an immense field. I’m aware of this. And I believe that I might not even get to the end of this field myself, in all of its—who extensive it is. But for me, the essential is to place the basis of a modern state, a state that is well-managed, and that benefits of its wealth by using it in the right way, and to be able to distribute it in a way that it is impacting directly on the population, and also increase development. And so talking about the Islamist threat, I said earlier that it is, indeed, a permanent concern for us. I didn’t know about it before I came into office. And of course, this is at the level of military intelligence, and even other intelligence, in order to have that kind of intelligence. When I was in opposition, we were not aware, privy to this information. So the first thing that I wanted to do, and which I want to do, it is to get my country as a member of the global coalition—of the fight against terrorism. We must all come together and share our intelligence and our experiences so that we will be able to eradicate this. So the example of the fight against Daesh has shown—ISIS—has shown that we’re all speaking the same language. If we do that, we will be able to eradicate this plague. On another hand, there is a fight against poverty. The Islamists are setting up exactly where there’s a lot of poverty, where there’s a lack of education, lack of instruction. So we must also go towards those solution to fight against poverty, and mostly to educate our people—the masses. And there, one of my priorities is to make education a requirement because, of course, where the Islamists are going to fetch people, it’s the younger people. And of course, the young—the youth in the Congo currently is desperate—completely desperate and without any hope. And so what I want to do is during my office time is make this a reason to hope for our youth by offering them, first of all, the chance to feely access education, and in the future to be able to find employment in a way—decent employment, that would allow them to recover their dignity and to prepare themselves to prepare to take over this country in the future. So this is a little bit of the way that I am planning to face the problems that you mentioned. BRIGETY: Are there any ladies to whom I might give the floor, who might have a question? No? Yes, sir. Please. Q: Good afternoon. Welcome, Mr. President. I’m Mvemba Dizolele with the International Republican Institute and Johns Hopkins University. Mr. President, your people in your country lost faith in the electoral commission. And this is why they continue to ask you these questions. In fact, the United States, which is ready to help, has sent mixed signals. They’ve accepted, they congratulate you for a victory, at the same time they punish members of the electoral commission, sanction them at the highest level, and also sanction members of the constitutional court. So that’s the message that is, at best, mitigated. How quickly will you move to, A, put the government there to restore the rule of law? And how quickly will you move to reform this electrical commission so that the country will start healing and getting a process that is credible and believable? Thank you very much. TSHISEKEDI: Thank you to you, Mvemba. And actually, thank you. I’m going to greet you. I’m glad to see you. I hadn’t noticed you there. You are asking a very good question. It is true that the elections didn’t go very well, like I said earlier. But indeed, and they shouldn’t, and I keep talking about to my counterpart in—American counterpart in Kinshasa and here, that this victory that is very fragile should not be destabilized again because we will not have different ways to stabilize the country. If we lose this, of course, fragile, weak balance. But if we don’t keep it, we might fall again in chaos that we were fearing before elections now since this chaos didn’t happen, and that these elections happened, you know, pretty OK considering. In 2006, let me remind you, we were two wars—I’m saying wars—in Kinshasa, at the heart of Kinshasa, in the area where you not there are many embassies over there. And adding those two wars, we counted more than 1,000 deaths. No international sanctions were taken. No investigations were opened. In 2011, and I know what I’m talking about because the UDPS was in the elections. Our leader, who is now passed away, Etienne Tshisekedi, was a candidate to the presidential elections. And we ourselves—we also said that—we declared that we had won those elections. And contrary to those who say today, we were able to demonstrate it on our time. And the country stood in crisis for many months. And there were manifestations everywhere. And the leader even had to be put into a house arrest in order to stop him from meeting his constituents. Today we are authorizing everyone who is even contesting the elections to have their meetings. That’s just for the historical background. Now I come back to say, in 2011 there were deaths of human beings during the electoral process and even after. No sanctions. In the contrary, the international community has recognized those elections. Which, according to the Carter Foundation, were an electoral catastrophe, (and I weigh my ?) words. And today, now that we’ve had peaceful elections—no death, not before, not during, and not after—with a change of power at the key level, while everybody was expecting the person in power to rig things in order to put his own candidate—no, it is the candidate of the historical opposition that becomes a president. And still, you want to sanction those who organized these elections. I believe that is an error in strategy. I do not say that these people are saints, and I explained to you that these elections, there were mishaps. But we have to recognize the merit of this, CENI, is to be able to organize elections without major incidents, as the ones we’ve known in 2011 and in 2006. I am the first one who was surprised. And I have the opportunity to say it frankly to all my American counterparts. And today, I am not pleading impunity, because I myself will sanction in the future, but I am pleading that people will accompany the Congo into stability. I’m not saying that the sanctions are useless, but I’m wondering what are they for? Because the process has given an expected result that is positive and that today the time is more into developing and moving forward, instead of blocking. So simply, this is what it is about. And it’s—and it pushes me to be very surprised why so many sanctions that are continuous, while—actually talking about the CENI. You know, this is a team that will stop working in June. Their mandate is over. In June they will leave. So if they were sanctioned for reasons of corruption, so we would sanction about three-fourths of Congolese because corruption is endemic in the Congo. We would sanction almost everybody and talk about all the political class that has been there for about—all these years. So if—so if it’s a matter of denouncing the results of the CENI that was proclaimed, that was not right, let’s talk about the results and don’t say on one side we are sanctioning your corruption but on the other side we are recognizing the result of this—that the CENI has published, and we’re recognizing the elected president. So, of course, it’s a dichotomy here. It’s a paradox that could weaken our current balance that we are trying to make, and that we absolutely do not need. As you know, the—you know the state of America, you can see how influenced you can be. I’ve always said that it is because of the position of the United States of America that the post-electoral process has been saved. They were tentative to destabilize us. That came from Africa and of Europe. I will not go back into those events, but it’s because the position of the United States was to acknowledge the result, and later on to say: We support the result of the—of the ballots, that everything else started to calm down. So now, having the United States coming back to their word and their support—removing their support from what themselves helped to make happen, I find it pretty strange. But I continue to believe that after I’ve done all this trip that today the opinion of the United States is much more positive than it used to be before I arrived here. And this is a good thing.